Hi! My name is Sarah Curtis! I am a stay at home mom of two in Virginia, a huge sports fan, and a Disney Addict! I first visited Walt Disney World when I was just 6 years old. I fell in love then and have always had a love for all things Disney! However, it wasn’t until my first trip as a mom, with my family, that the real obsession began. On that first family trip, we were all bit by the Disney bug. I cried the first time my kids saw Mickey Mouse. It was so magical. I felt like a kid again and loved seeing the magic through their eyes. Since then, planning Disney vacations has become a passion for me. I loved planning magical vacations for my own family and soon, everyone I knew was asking me to help plan theirs as well. Joining the MickeyTravels team was a dream come true for me and I want to make all my clients’ dreams come true as well. 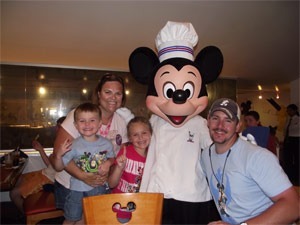 I would love to help you plan your next Disney vacation and will pour my heart into it as I would for my own family’s. Let me do all the work for you and all that’s left for you to do is have fun and make memories! Hi Sarah! Just wanted to let you know we’re back home. We had such a fun time. The kids can’t stop talking about all the great things we did. They loved the character breakfast and all the meals. It was perfect! Thanks for your help scheduling everything. I don’t know how you did it, but we appreciate everything. THANKS SO MUCH! Sarah is incredible. She knows so much about Disney and really made us feel assured we would have a great time. That was an understatement! We had the BEST time! I’m forever grateful for her help in planning our vacation. We can’t wait to start planning our next one…hopefully soon!